Palpatine’s heart is palpitating with the prospect of fame and fortune after being asked for his autograph by an online fan. 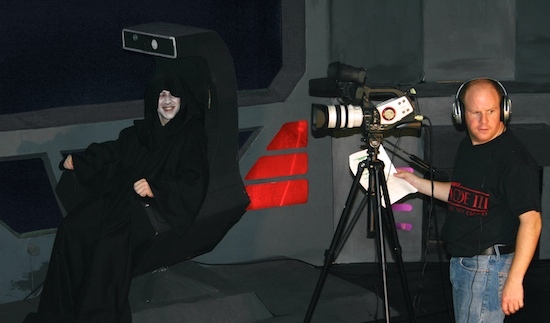 It has been a number of years since the second Star Wars spoof was completed but many people are still watching it online. They have been leaving comments as they do. One of them has been so impressed, after watching both films, that he has asked for an autograph from the ‘person who plays the emperor’. And this (most of the time) was Darren Scales. “The greatest accolade anyone can get is from a true fan,” he said. “It is wonderful to see so many people enjoying watching our work, so many years after we enjoyed making it.” This echoes his sentiment when The Emperor’s New Clones was screened at the Chapter Arts Centre in Cardiff last November, and many of the cast got to meet up with fans there. Everyone at Backyard Productions has been truly amazed by the response there has been to our amateur movies. This not only includes the latest request for an autograph and leaving comments, but even a fan-fan-film based on the George Lucas character from The Empire Strikes Backyard. Meanwhile, Darren will be sending the lucky(?) fan a signed picture… when he gets back from Cloud 9.